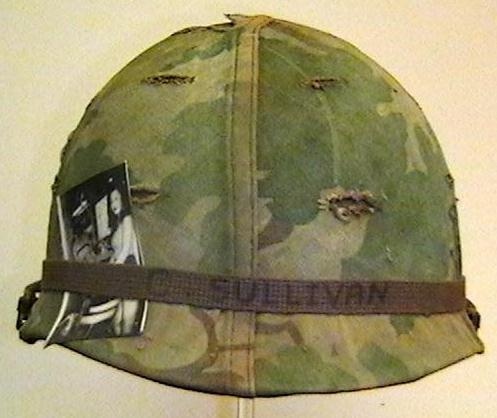 In Military and Wartime > Military Helmets > Show & Tell and Military and Wartime > Vietnam War > Show & Tell. This U.S. Army helmet is a piece of art. 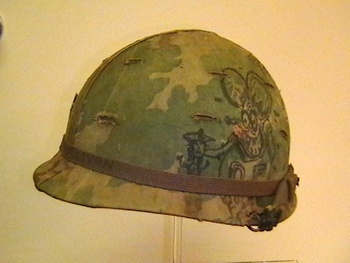 The Mitchell helmet cover has the original graffiti that was inked on in the late 1960s. 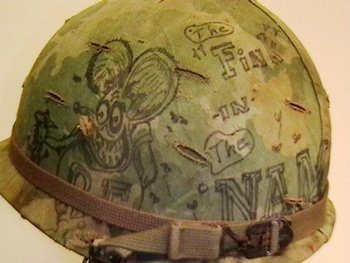 The 1967 dated cover features the Rat Fink character grasping an enemy Viet Cong, as well as other graphics. The Rat Fink was originally drawn by artist Ed Roth. The elastic cammo band holds a picture of a Vietnamese bar girl, and has the soldiers name written on it. The helmet was picked up at an estate sale, and family members always remembered the picture being with the helmet. A super nice Vietnam era helmet. I'd like to meet the guy that wore it.Hope he got home OK.
Wow! Awesome on so many levels. i love this helmet and wish it was for sale. and i agree with straightleg hope he got home okay. Britt I don't see any of the images on your website . Ok guys now I wonder so what is it :-) Curious now . I can barely make out one image what is the photo that looks like it has ears AR are you there ???? Britt, I don't see anything that resembles the artwork on the helmet on your website. Where is it exactly? I got the helmet at an estate sale about 10 years ago. The cover is dated 1967, as well as the liner. The woman said her brother served in Viet Nam from 1968 to 1969. The helmet was put in a duffel bag after he returned to the states and stayed there. The family forgot it was there and when the vets father passed away they cleaned out the house and found the duffelbag in the attic. The sister commented on the photo of the girl, recalling it was on the helmet as the helmet sat in a closet for a while before being packed away. When her brother moved out of the house he did not take the bag. She asked if he wanted his souvenirs and he said no. 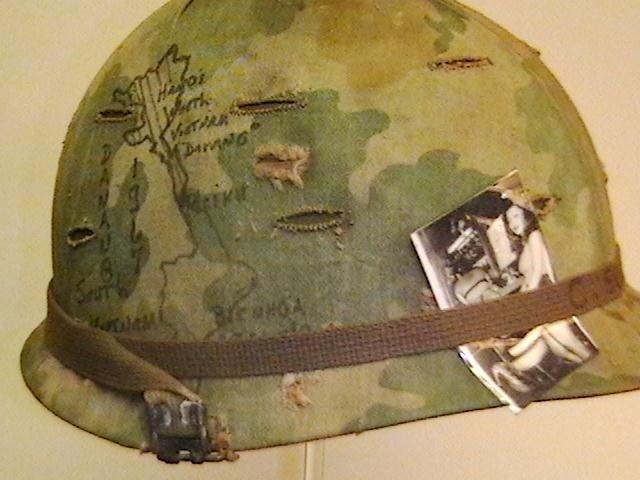 I was also able to get a few North Vietnamese items that he had brought back with him, such as a pith helmet, belt and buckle, and a flag. Thanks vanskyock24, and a special thanks to Manikin and others on CW who served our country. By the way, everything on the cover was done by hand in black ink. Thanks Stepback I think your helmet is great . I sure did not go on front lines I was in VA hospital during Nam and lost alot of friends then . It was a time time for these guys and they deserve the credit they so long have been overlooked . Thank you Manikin(Marty) for your service! I'm going to make a stand on this one! I believe that is truely a Vietnam era helmet, and was drawn by it owner at the time. Thanks Stepback for sharing this GREAT piece of our history. And a special Thanks to Manikin(Marty) for your service to all in need and welcome home.